“The goal of tareeq (Tasawwuf/sulook) is to gain Allah SWT’s pleasure. For it two things are required, one knowledge regarding the method of obtaining it and other is action according to it. As for the method, it is only one. That is to act on the exoteric (zahiri) and esoteric (batini) commands of Shariah. Two things assist in it. Firstly, zikir (remembrance of Allah SWT) as much as one can consistently do. 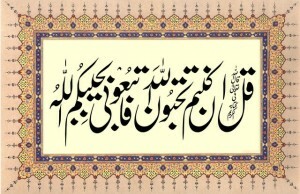 Secondly, suhba (company) of the ahlulAllah (pious) as much possible. If one can not spare time for it (for genuine reasons) then reading books of and about the pious can also substitute for it. Two things are an obstacle in acheiving this goal. That are, sins and being occupied in fadhool (useless/non-essential). This entry was posted in A. Reality of Tasawwuf on March 11, 2006 by 'abd.